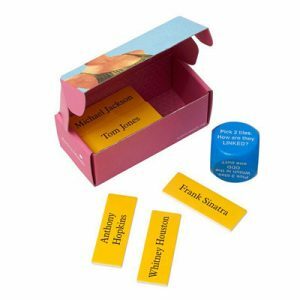 Link & think is an engaging cognitive stimulation game that encourages great conversations by helping individuals create associations between their favourite celebrities. Group or one-to-one game. Hilarious conversations are bound to ensue when people begin chatting about their most loved (or disliked) celebrities. Do you prefer Frank Sinatra or David Bowie? Link and Think was designed as an inclusive but challenging cognitive activity for people in early to mid stages of dementia. A great exercise for the family member of the person with dementia to open up their communication and to discover more about that person’s thoughts and opinions. The game works by rolling the dice and following the instructions such as; Pick 3 tiles, which is the odd one out? Then select the tiles at random and discuss.